A big part of JNK Llama Farm is our llama therapy work. Not only is it a calling, it is a PASSION! 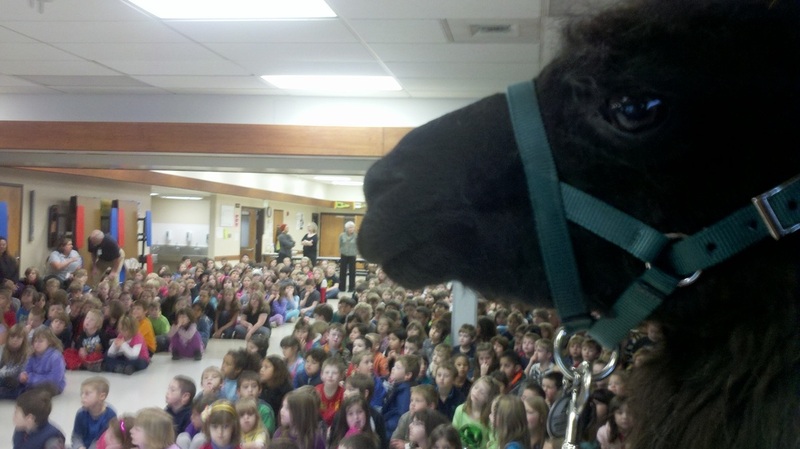 Many people do not realize what great therapy animals the right llama can be. Not all llamas are cut out for this job, but there are some pretty magical therapy llamas out there that are quite effective. We are currently using six llamas to do therapy work (a miniature horse too) and they are very independent llamas that are totally bombproof. Three intact males and three female (one is a daughter of our other original therapy male) llamas are registered therapy llamas through Delta Society now called Pet Partners. One of the very cool things about our animals is that we are on our second and third generation of therapy llamas from our bloodlines. We are now using offspring from sires that are or were previously registered for therapy work! 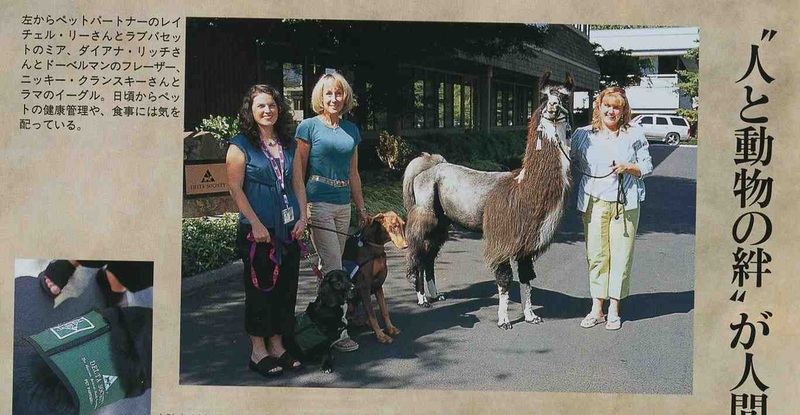 Additionally, we have two dam lines that have produced three therapy llamas each. Our babies born are trained from the start to be able to do this type of work and it is paying off! 5 of the current therapy animals listed below were trained and bred by us from our lines! Our llamas have/do participate at many nursing homes, an HIV group home, elementary reading programs, Camp Korey (one of the Paul Newman "Hole in the Wall Camps" for kids with life threatening illnesses etc. ), schools, ALS walks, hospice and any other opportunities that present themselves and we have time for. 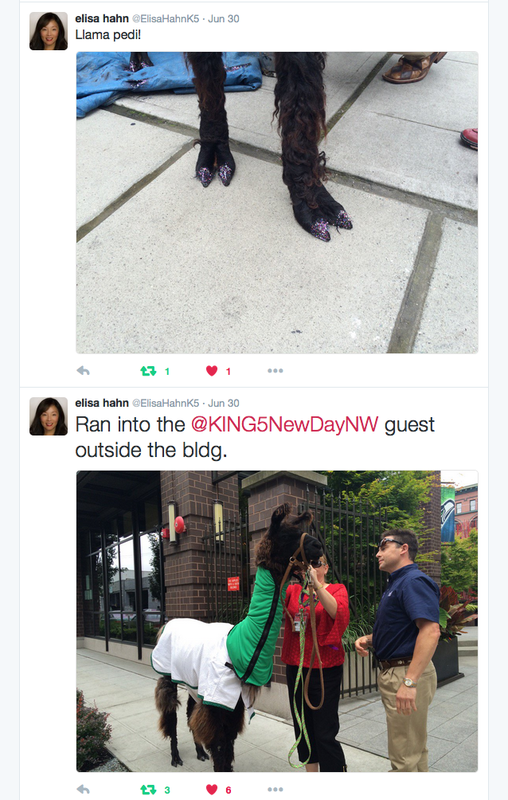 We want our llamas to enjoy visiting as much as we do. As such, we do not push them too hard by taking them on too many visits. Llamas should not hum/moan the whole visit and have their ears back most of the time. They also should not wear diapers, have costumes on or other things of this nature. Visiting should not be done with the focus on taking pictures and feeding the animals. Confidentiality, hygiene and safety are of the utmost concerns when we go on visits. A happy therapy llama readily interacts with clients and is not pushy or begging! Our llamas are LLAMAS first and foremost, doing therapy work is a reward that happens a few times a month. 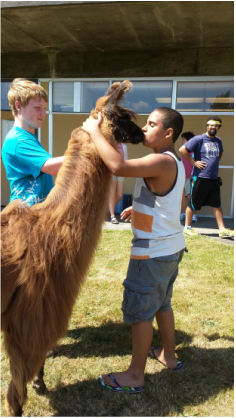 Because of this, our llamas truly enjoy interacting. We honor and respect them! Recently we have had several people ask about using our llamas in weddings. We are willing to do this occasionally, but not all the time. Our llamas will not be exploited/overused to make money. Putting the warm back in fuzzy, is our first concern! We also have a miniature horse we are doing therapy work with. His information is HERE. Flight & Niki Christmas Day 2016 visiting with residents. Maybe you want to volunteer with your llama or alpaca? Here is a Pet Partners video with Niki's input on this process. 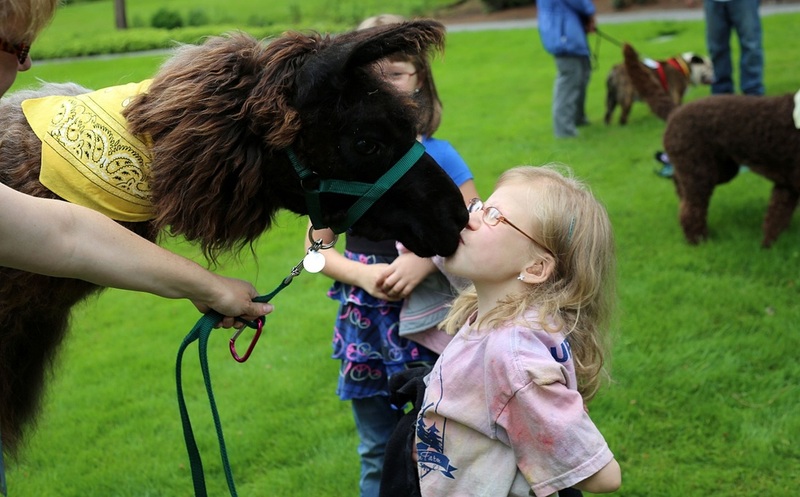 Would you like to see what it is like to have Flight the llama visit and give out kisses? The first female therapy llama we had registered is NH Flight of the Eagle and she was registered to do visits for her owner Marilynn. Marilynn had Lou Gehrig's Disease or ALS and dearly loved her beloved llamas. When Marilynn was very sick and hospitalized in the early Winter of 2009, we made the decision to test and register Flight. Flight was Marilynn's last baby born and had been a very accomplished show llama. Upon being registered Flight became eligible to visit Marilynn in the future when she was in the hospital. Sadly, Marilynn passed away in August 2010. Flight is Complex Registered with Pet Partners. She is one of our two senior bombproof therapy llamas. You may have seen Flight on television or in the various book and magazine articles that have highlighted her amazing abilities! She is a pretty famous girl! One of our current males we are using for llama therapy work is Marisco. He is as bombproof as they come and has also been rated Complex on all his evaluations. Marisco loves kids and visiting the elderly. He is also one of our two originally registered therapy llamas. He has produced two therapy llamas himself. Incidentally, his daughter "JNK Normandie's Gevalia" is a Complex registered therapy llama. Another daughter JNK Marisco's Zela is registered as well with her owner. JNK Tobia's Caldera aka Dara is a Complex registered therapy llama. Dara is one of our five JNK bred animals that are registered for therapy work. Her sire has produced 4 therapy llamas & a granddaughter is registered as well. As Dara is a packer style llama (called a classic), we get a lot of comments on how different her coat is from some of our other therapy llamas. Dara has many halter and performance titles to her credit and was a national reserve grand champion in halter. Currently she is nursing a baby. JNK Cayetano is one of our intact males who is now registered Complex. Cayetano is a packer style llama and about as sweet as they come even as a breeding male. He, Trask and Dara are half siblings through their dam. Cayetano has had an excellent show record too! He is a JNK bred and trained llama! Cayetano has sired several offspring now! JNK Huaycool's Rosabella is another JNK bred animal that has been a part of our therapy team. Since the day she was born, Rosabella has been a character and showed an aptitude for therapy work. She is Complex registered with Pet Partners. Rosabella is a highly awarded show llama too. Her first offspring (by Marisco) was born in Spring 2016 and is already starting his therapy and show career. Rosabella is taking 2018-19 off as she is on maternity leave! We will renew her after that. "JNK Normandie's Gevalia" has been a Complex registered therapy llama. Gevalia was born here and had been initially handling by Jeff & Niki, then Drew a 4-Her. Gevalia loves interacting with people and likes visiting children especially. Gevalia is owned by Terry & Sandra Spekreijse. Currently she is on maternity leave! 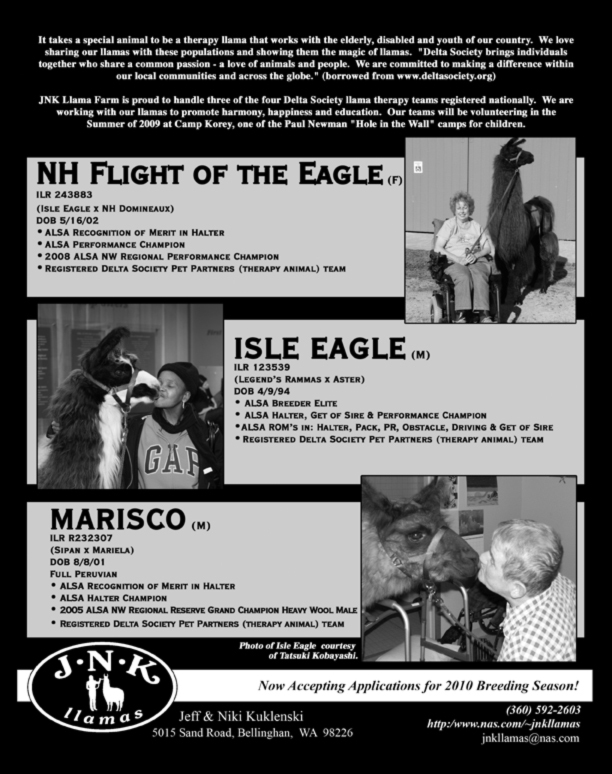 "JNK Tobias's Trask" is a Complex registered therapy llama with Niki. He follows in the footsteps of his older full sister Caldera and big brother Cayetano. Trask is very curious and loves meeting new people. As he is younger, we will begin using him in the right situations without pushing him too hard. Trask is the 3rd llama from this dam line and 4th from this sire line to become registered for therapy work. 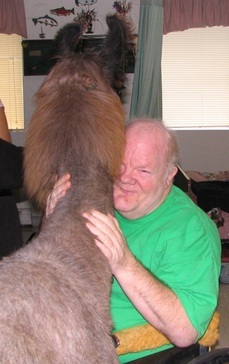 Sadly, we lost our other original Pet Partner therapy llama Isle Eagle in September of 2010. He was the ideal therapy llama and earned a perfect score on his test to become registered both times he was tested. Eagle is the sire of one of our therapy llamas NH Flight of the Eagle. He has a granddaughter that is now registered. In his career prior to being registered for therapy work, Eagle became the most awarded llama in the country and a PLTA Master Packer. Niki is an evaluator and knows the criteria/process for Pet Partners evaluation for Camelids. She rewrote their information and testing process in 2009. Prior to that, most of the evaluation was applicable to dogs. The rewrite included things like backing out of rooms because of the llama size, walking past flowers/plants, touching on the body and more. If you want more information about the process or being evaluated, please feel free to contact us anytime! Niki is an advisor for Pet Partners on various aspects of camelid therapy work. We love sharing our therapy llamas with others and we need more llamas out there doing therapy work....Currently, we have several adult therapy teams we have mentored....Therapy Llamas ARE MAGICAL! Regular updates, information, pictures etc. on our work can be followed on Facebook under "Registered Therapy Llamas." and video by COLORS Magazine! Click HERE for information Camp Korey where we volunteer!